Space-saving 24" wide undercounter design. Produces up to 251 lbs of ice per day. Pure Ice® exclusively by Ice-O-Matic. Built-in antimicrobial protection for the life of the ice maker inhibits bacteria growth on ice maker surfaces. 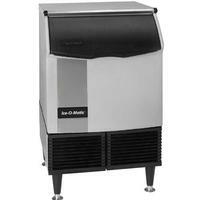 Ice-O-Matics optional water filtration system provides protection against unpleasant tastes, odors and scale formation. Longest warranty in the industry. Purchase an Ice-O-Matic water filter with your cube ice maker, replace the filter every six months, and the evaporator warranty is extended to 7 years parts and labor (available in the U.S. and Canada only). Constructed from corrosion-resistant stainless steel and fingerprint-proof plastic. Every Ice-O-Matic ice maker is backed by a warranty that provides both parts and labor coverage. Three years Parts and Labor. Five years Parts coverage on the evaporator and compressor. Seven years Parts and Labor on the evaporator when you purchase an Ice-O-Matic water filter with your cube ice maker and replace the filter every six months (available in the U.S. and Canada only). Front air discharge design for compact spaces. Low profile top saves counter space. Stores up to 70 lbs of ice. Easy front access to ice. view 3 year parts & labor warranty on all components, std., 5 year evaporator warranty, std., 5 year compressor warranty, std.